​the transformative power of yoga. "I learned so much about poses that I've been doing for years! 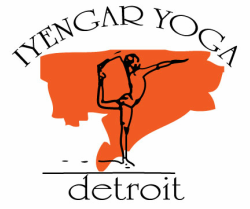 I told all my serious yoga friends about Iyengar Yoga Detroit." "I like the way that all instructors at Iyengar Yoga Detroit are not only intentional about the practice they provide, but they're also intentional about developing and supporting community." All bodies, all abilities, all sizes welcome, and wheelchair accessible. Wide array of poses taught in a variety of ways from high energy to restorative to therapeutic. Individualized teaching to suit all needs and capacities. Highly trained teachers (certification takes 3+ years), and 14 levels of certification. What’s Special About Iyengar Yoga Detroit? Community-centered, trauma-informed safer space, Cooperatively-owned and run. People of color-centered. Affordable classes, flexible schedule, including Community Gift (sliding-scale) classes . Philosophy study as well as Asana (postures), Pranayama (breath work), teacher training, and weekend workshops. Focus on personal practice and healing injuries and chronic conditions.